British prime minister announces she will seek another "short" Brexit extension at an EU leaders' summit in Brussels on April 10. Prime Minister Theresa May met Wednesday with Britain's opposition leader in a bid to forge a Brexit compromise that avoids a potentially chaotic "no-deal" departure from the EU in nine days. May tore up her steadfast strategy and sought Labour leader Jeremy Corbyn's support in a surprise last-minute move that could determine the fate of the country and her government. The premier emerged from a seven-hour meeting with her ministers Tuesday to announce she would seek another "short" Brexit extension at an EU leaders' summit in Brussels on April 10. She crucially added that she was now willing to bend her previous principles and listen to proposals for much closer post-Brexit relations with the bloc than most in her Conservative party are ready to accept. "I think there are actually a number of areas that we agree on in relation to Brexit," May said of Corbyn ahead of their talks. She did not rule out remaining in a customs union with the European Union -- a key Labour demand that she has until now dismissed out of hand. The British premier's change of tack has been received cautiously by EU leaders who wish to see the split resolved by the time European Parliament elections roll around at the end of May. European Commission president Jean-Claude Juncker delivered a nuanced address to the European Parliament in which he vowed to "personally do everything I can to prevent a disorderly Brexit" when the new Brexit deadline arrives on April 12. German Chancellor Angela Merkel likewise vowed to "fight until the last hour" to avoid a no-deal Brexit. But May's olive branch to Corbyn enraged the staunchly pro-Brexit wing of her Conservative party. Junior minister Nigel Adams resigned in protest at her "grave error" in judgment. Fellow junior minister Chris Heaton-Harris said he was resigning his Brexit department post because he wanted Britain to leave on the original deadline date of March 29. "I simply cannot support any further extension," he said in his resignation letter to May. Yet the most prominent Brexit-backing ministers held their fire as all eyes turned to the outcome of May's first meaningful engagement with her top domestic rival. Corbyn has sought to keep Britain in a European customs union after Brexit enters into force. May's government has previously rejected this because it would keep Britain from striking its own trade agreements with giant nations such as China and the United States. Barclay said failure by May and Corbyn to reach a compromise would prompt the two sides try to come up with some mutually-acceptable options that would be put up for a vote in parliament in the coming days. He said these would be "binding" on the government -- even if parliament came out in favour of the customs union being added to May's existing deal. "In the national interest, (May) would accept what the House voted for," Barclay said in reference to a customs union. The timeframe she laid out Tuesday is meant to see Britain leave the bloc on the day before the first nations holds their European Parliament votes on May 23. May's spokesman conceded that Britain would still probably have to prepare for elections just in case. Britain must formally notify electoral authorities of its participation on April 11. The British pound has moved higher on expectations of the sides managing to avoid a messy breakup in the coming days. Some currency traders were also cheered by the possibility of Britain preserving closer economic ties with its main trading partners in Europe down the line. 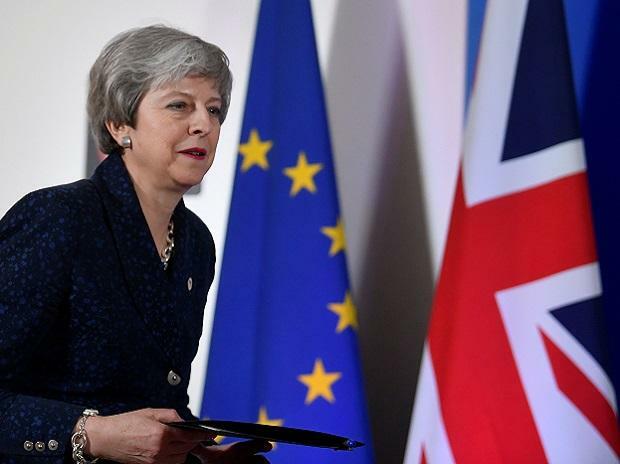 "Not only did May reaffirm her opposition to no-deal, she's technically opened the door to a softer Brexit," Oanda trading house analyst Craig Erlam told AFP.